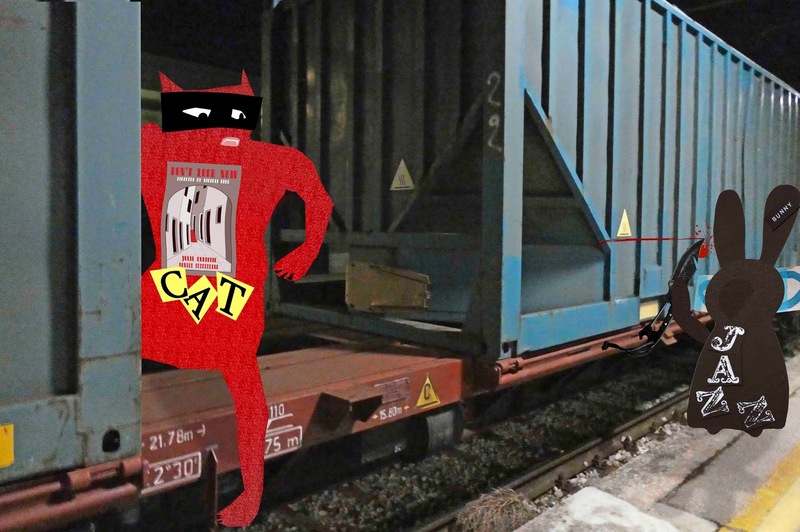 The freight train coasted into Padova Central Station and Skratch the Cat stepped off. He'd had no intention of taking the train but some deep instinct told him to do it. So he'd boarded the train in Turin, then curled between two containers as it rattled at high speed towards Venice. When the train shuddered to a halt, he woke up. He was puzzled. He knew it wasn't supposed to stop until Padova Freight Village so he shook himself alert and looked down the platform. A familiar figure hopped along the platform and into the distance. Skratch purred and was about to meaow to his friend - but something stopped him. "That's not the Wabbit," he murmured. The figure plucked an edged weapon from his fur and drew it along the containers. It made a rasping sound. Blood dripped from the blade. The figure's turn was abrupt and Skratch snapped back and out of sight. A whistle blew, then with a screech the train began to move. Rails squealed as the train picked up speed. Skratch leaped for the other side of the train and when it reached the end of the platform, he jumped off and slid behind a building. The figure remained alone on the empty platform, looking from side to side and shouting. "Come out. I know you're there," Skratch was as quiet as a cat can be. He dropped onto the westbound rails and prowled past him to the exit. "I'm neither here nor there," he purred ... and he vanished into the city.